Sydney Rubbish Removal & Skip Bin Alternative | 1800-GOT-JUNK? 1800-GOT-JUNK? specializes in full-service, easy and efficient rubbish removal for Sydney homes & businesses. We provide fast, reliable, same-day service, and will take any amount of rubbish you have, whether it’s a small pile of items or an entire floor of furniture, from wherever it is. You don’t have to lift a finger. People often call us when they’re moving house or flats, and we get a lot of calls from people who need help with furniture removal when they’re downsizing. People who need a sensitive hand dealing with an estate cleanout also call us often. Many of our customers consider us to be an excellent alternative to skip bin hires in Sydney. For commercial jobs, we find ourselves involved in clearing out all kinds of things: demolition waste, redundant marketing material (for retailers), office furniture and electronic waste, to name a few. We make every effort to dispose of your items in an environmentally and socially responsible manner whenever it’s possible, and strive to provide rubbish removal and disposal that Sydney is proud to use! This year, we are stepping up our diversion efforts to be the most environmentally friendly rubbish removal service in Sydney. Our goal is to divert 50% of what we pick up from the landfill. Why use 1800-GOT-JUNK? for Rubbish Removal in Sydney? Other than our commitment to recycling or donating as much of what we pick up as possible, we consider our commitment to excellent customer service the one thing that makes us different from all the other rubbish removal services in Sydney. We all know that trades businesses are notorious for not turning up on time, if they turn up at all! At 1800-GOT-JUNK? Sydney, we make a point of calling ahead and letting our clients know when we are going to be there. Your time is valuable, which is why we commit to a two-hour promise window so you know when we’ll be around to pick up your rubbish. And we try our best to stick to our word. Lastly, we’ve heard that our Truck Team Members are easily the best-looking and the best-dressed rubbish removal experts in the industry – but you’ll have to book us to have your rubbish picked up to see for yourself! Although 1800-GOT-JUNK? is the leading provider of residential rubbish removal, did you know that we also offer a wide array of commercial rubbish removal & disposal services? 1800-GOT-JUNK? , the trusted name in rubbish removal since 1989, is the solution for any business looking for a quick yet professional provider of commercial waste disposal. As the world’s largest rubbish removal service, take solace in knowing that we have your business’s best interest at heart. Learn more about our commercial rubbish removal services & let us show you how we can help! Book Your Rubbish Removal Today! 1. Call us to book an appointment, or book an appointment online, and we’ll come out to take a look at your rubbish. When we see what you’ve got, we’ll give you an up-front, all-inclusive price to take it away. 2. If you like the price, we get started picking up your rubbish from wherever it is, and disposing of your old, unwanted things in an environmentally responsible way. Hi, I’m Keith Muir, the General Manager of 1800-GOT-JUNK? Sydney. 1800-GOT-JUNK? has been operating in Sydney since November 2005 and now operates in Melbourne, Brisbane, Perth, Adelaide and the Gold Coast! You have probably seen our clean shiny trucks driving all around Sydney, from Palm Beach, down to Rockdale and out to Parramatta; we’re always busy removing junk from people’s homes and offices all around Sydney, helping our customers reclaim their spaces. Spending 11 years at McDonalds and 4 years at Bunnings Warehouse has instilled an absolute understanding of customer service in me. 1800-Got-Junk? isn’t just a rubbish removal company, we are a people business that just happen to collect junk. The level of service we provide, right from the beginning at our centralised call centre & our unique online booking engine, to the call to confirm the exact time of arrival within our booking window, all the way to our friendly uniformed drivers who visit our customers every day, is completely unique to the industry and we strive to WOW! our customers every day with our service. Not only do we treat our customers well, but we also treat the environment well. Our teams work hard to divert as much as possible from landfill. We partner with a number of charity organisations to re-home things that are still usable and we partner with a number of recycling centres to recycle over 60% of all of the junk that we collect! At 1800-GOT-JUNK? we get a buzz out of giving our customers their space back and wowing every one of them in the process! I love seeing the smile on customers’ faces when they see their spare room now empty of clutter or finally being able to put their car back in the garage again after many years as well as helping business to save thousands in their bond when they can hand the keys back to their office space completely clutter free. Our team look forward to seeing you around Sydney! Click Here to check out our online booking agent and we could have a truck out to you today! The St. Vincent de Paul Society is a long-standing charity that’s well-known for the good work they do around the world. 1800-GOT-JUNK? Sydney has been donating saleable items to Vinnie’s for a few years now. We fill our storage facility with items that would have ordinarily ended up in the landfill. When we have enough inventory that we think would interest the charity, we give them a call and they come over and choose what they want. They say they’re always happy to come to 1800-GOT-JUNK?, as we always have great pieces and the items are in a tidy pile next to the loading area, ready to go. They’ve told us that while some people leave them with unusable items to get around landfill fees, they appreciate that we take the time to select and prepare items for their choosing. We often pick up furniture that will either be donated to someone less fortunate or sold with the funds going towards providing one of the many services St. Vincent de Paul offers in our local community. The St. Vincent de Paul Society formed in Paris around the time of the revolution. This was a massive upheaval for the majority of the citizens in Paris. Many of them found themselves struggling in this newly forming society. A local university student became frustrated with the situation and desperately wanted to help his fellow countrymen. He started by donating his personal winter stockpile of heating wood to a widowed neighbour and encouraging his friends and colleagues to help out where they could too. Almost two centuries later, the charity is still going strong and has spread throughout the world. Donations of time, money and saleable items is how they fund this great work. It’s a privilege to be affiliated with Vinnie's! Moving house is one the few life events that forces you to make hard decisions about what to keep and what to throw away. As we move through life, we inevitably accumulate stuff that we no longer have a use for. At 1800-GOT-JUNK? we recognise that moving house and de-cluttering go hand-in-hand - that’s why we partnered with PODS. You call PODS and they will deliver a container, available in three convenient sizes, right to your door. You work out what you want to keep and what you want to get rid of. For the stuff you want to keep, you either pack the container yourself, or you let one of PODS professional packing partners do all the work. For the stuff that you want to get rid of, you call 1800-GOT-JUNK? (1800 468 586) and we will provide you with an obligation-free quote. When your container is packed, PODS will collect it or store it for you. The best thing is, when you do finally open your container, you will have peace of mind that everything in it was worth keeping! Electronic waste (e-waste) is accumulating around the world at an ever-increasing pace. But how quickly, and why? This leads to a situation where we, as consumers of these products, are upgrading our devices at an increasingly quick rate. This is good news for manufacturers and consumers, who regularly upgrade their electronics, but it’s bad news for the planet. Greenpeace has published studies suggesting that only 25% of Europe’s e-waste is recycled properly, and that figure is down to 20% in the USA. It’s just 1% in developing countries. In some countries, the vast majority of e-waste is taken straight to landfill. When these landfills get too big, the pile is simply burned. This releases chemicals into the air, the earth and eventually the food chain. Don’t upgrade to the latest technology if it’s not necessary. If your current setup is serving you well and continues to allow you to function day-to-day or compete in your market, then there is no need to upgrade. If you must upgrade but the equipment still works, then sell or donate it. If you don’t have the time or means to do this, 1800-GOT-JUNK? Sydney can help. If you have broken equipment that has no market value, then dispose of it in an environmentally friendly way. 1800-GOT-JUNK? Sydney recycles nearly all of the e-waste we pick up. In Sydney, there is a large Nigerian community that is doing what it can to alleviate some of the e-waste (as well as social and health) issues in Nigeria. One of the Sydney-based Nigerian community leaders approached 1800-GOT-JUNK? to see if we could help by supplying reusable/repairable computer hardware. We were only too pleased to help. We offered to take the time to separate out the items that they would like and store them in our warehouse. Once a week, they come by and select the items they think they can use. Good-condition hardware and other items are then repaired and sold to fund larger humanitarian projects or donated to schools in Nigeria. Any unusable items are taken to a reputable recycler who will break down and recycle as much of the material as possible, greatly reducing the amount that was originally headed for the landfill. If you have any of the above items and would like to see them kept out of landfill, then call 1800-GOT-JUNK? Sydney - we’d be happy to provide our service! If you’re worried about your hard drive containing personal information, please clear it before calling us (or we can provide proof of destruction). If your e-waste isn’t on this list, we’ll still recycle any other electronics you may have. Landfills across Australia are inundated with old mattresses. Each year, around 1.25 million mattresses are headed for the landfill. Most rubbish that goes into a landfill is crushed to reduce the size, which saves valuable space, but mattresses are inherently difficult to crush due to their springs. A typical mattress takes up 0.75 cubic metres and cannot be easily crushed, whereas most other rubbish can. Around 1.25 million mattresses are tossed every year, which means mattresses take up 937,500 cubic metres of landfill space. Could you imagine a pile that big? At 1800-GOT-JUNK?, we take the time to separate, store and process all the mattresses we pick up from clients. Those that are in good condition are donated to charity, and the rest are separated into their constituent parts by us or a dedicated recycler. We work hard to look after the environment. Currently, over half of all rubbish collected is diverted from landfill and reused/recycled in some way. If you’re in need of mattress removal in Sydney, call us today, or book your mattress disposal online. We’re happy to come by to pick up your mattress, and ensure that it gets recycled responsibly to keep it out of the landfill. At 1800-GOT-JUNK? Sydney, we are serious about our recycling efforts and keep rubbish away from landfill. 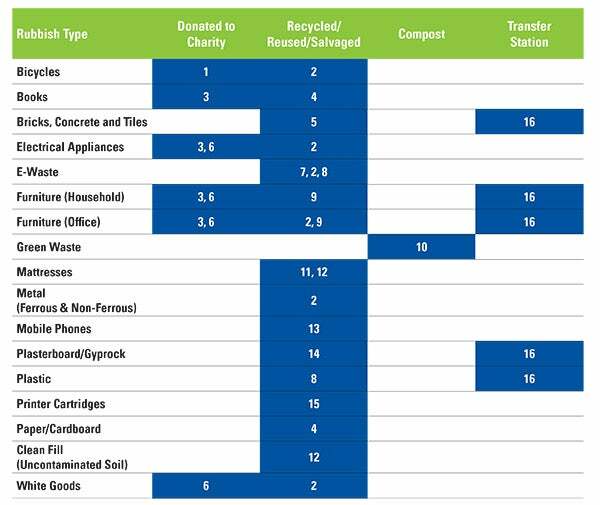 Over 40% of all the rubbish we collect (by volume) is recycled, salvaged and/or donated to charity. The table above shows the common types of rubbish we collect and how we prevent it from filling our landfills. Have a bike to donate in Sydney? We can help! Want to donate your old bike, but don’t have any way of getting your bike to where it needs to be? Bicycles for Humanity (B4H) have partnered with 1800-GOT-JUNK?, a full-service rubbish removal company in Sydney, to remove your old bicycles and make sure they are given to the people who need them most. For a $60 surcharge, 1800-GOT-JUNK? will call around to your home, pick up your bike and transfer it to the local B4H depot. The best thing about the service is you don’t even have to be with the bike. Simply leave the bike in a place where it can be easily accessed and let the 1800-GOT-JUNK? truck team do the rest. Start by calling the toll-free number 1800-468-586 to organise your bike pick-up. Let us know your postcode and we will tell you what day of the week we will be in your area. Choose an arrival window and we will call you when we are on our way. If you can’t be there – simply leave instructions as to where we can find the bikes. Relax in the knowledge that you old bike will be going to a really good cause. *Pricing surcharge applies for 1-3 bicycles and/or bike frames irrespective of size. Standard 1800-GOT-JUNK? pricing will apply for 4 bikes or more. All other rubbish will also be quoted as per 1800-GOT-JUNK’s? standard pricing policy. One man's trash...is authentic Simpson's artwork? 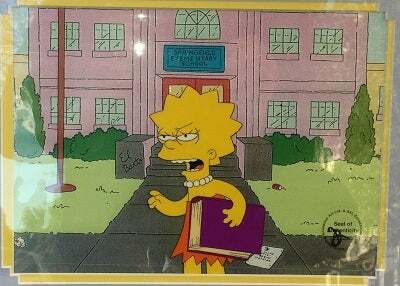 One of our rubbish removal experts found a fully authenticated piece of Simpson’s artwork: a portrait of Lisa Simpson! While we usually get used furniture, old mattresses and outdated electronics, we get the occasional rare gem that we need to tell the world about. We’re truly amazed at some of the things our truck team members bring back.